The homestead guilt I have felt for the past two years of working my buns off on Spark Freedom instead of furthering the homestead has been immense. On the one hand, my personal goals of independence are important and I am not getting any younger. On the other, Spark Freedom has a valuable, freedom-oriented mission that I am willing to put my all into. The upshot? We didn't keep up on yard trimming and the local farmers here have seen some of my dollars while I buy in-season veggies to preserve for the winter when my crops failed. Guilt is now gone - As it turns out, Mr. Kruse, master gardener and bunker builder, must have planted some blackberries when he built this homestead retreat. We had a bumper crop that is already done well before the local wild blackberries even thought of ripening. Having gorged ourselves on as many fresh ones as possible, we decided some blackberry jam would be excellent this winter. 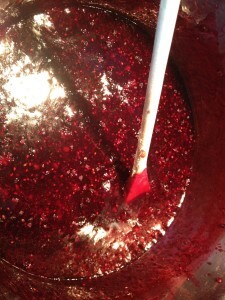 If you have not made jam before, it is the second easiest way to start canning and the Christmas gift payoff fantastic. All you have to do is buy a box of pectin and follow instructions in the package. To protect your family against food-born pathogens, don't follow grandma's method of baking jars upside down to seal lids. This has not been an acceptable preservation method for a very long time and with reason. If anything manages to get in there while you are pouring the hot jam into the jars, or if you did not do well sterilizing your jars, you may end up with moldy, wasted preserves. Anyway, the lesson learned this year on the blackberries (wild and domestic) is that simply following the instructions on my packages of pectin yielded runny jam. If you are running a local batch here in Dekalb County, I recommend you add 1 tablespoon of lemon juice or increase your pectin amount if you are using jarred pectin. It seems like everything ripens at the same time in the summer. In years past, we have reverted to canning quick pickles during the cucumber glut of the summer because we were also pressure canning corn, beans and tomatoes and there was no time to get fancy. Fermented pickles can be canned after fermentation or stored in their brine in the fridge. This year, time got spare and we had not even begun to think about canning our cucumbers before a Sunday evening business flight. In a moment of desperation, I paged through my Encyclopedia of Country Living and looked up how to make fermented pickles. Twenty minutes later, the crock was packed, brine was in, and I was on my way out of town for the week hoping nothing would go awry. Two weeks later, we just fished a fermented cucumber out of the crock to give it a try. It is unbelievably yummy. Quick pickles are about to become a thing of the past in the Holler. Driving to the store for a carton of sour cream is not economical when the nearest store is 12 miles away. Yet green chili rellenos (baked from the frozen stock of the summer) just don't taste as good without the creamy additive in the rice. A few weeks ago, when faced with this problem, I started wandering around the Web looking for recipes. After testing a few, I found that the half and half, plus the last few tablespoons of sour cream method is the easiest. The biggest surprise was that the resulting homemade sour cream tasted much better than the very batch that supplied the "sour cream start." Put all into the jar. Cover. Shake it! Wait 12-24 hours until it is firm and enjoy. My theory is that it tastes better because the half and half that we put in our coffee is of a better quality than the cream used in commercial production of sour cream. Or maybe it is just fresher. WARNING: Don't used ultra pasteurized half an half - I get mixed results with it. I had a little fun with my new Storm and shot a casual video demo - not bad video quality for a phone. Here is a photo of my home-made T-Shirt Tomato Strainer Bag. For the record, I bought NEW undershirts for this purpose. I guess I am not the only one to recently get the infamous call. You know, the one that reminds you of a lesson you once painfully learned? My dear roomie called me from work to let me know that instead of dishwasher detergent, liquid dish soap had been put into the office dishwasher. With results much like those pictured on ABlogAboutThings.com's site, we had to quickly figure out how to get rid of the bubbles. And yes, the vinegar worked.